1 Now this is the commandment– the statutes and the ordinances– that the LORD your God charged me to teach you to observe in the land that you are about to cross into and occupy, 2 so that you and your children and your children’s children may fear the LORD your God all the days of your life, and keep all his decrees and his commandments that I am commanding you, so that your days may be long. 3 Hear therefore, O Israel, and observe them diligently, so that it may go well with you, and so that you may multiply greatly in a land flowing with milk and honey, as the LORD, the God of your ancestors, has promised you. When Jesus was asked what the greatest commandment he, like most Jewish people of his day, quotes Deuteronomy 6: 4-5 and then he attached on Leviticus 19:18, “you shall love your neighbor as yourself”. This is the heartbeat of the Jewish, and later Christian, walk with the LORD. They are to be a people who have one LORD and only the LORD who is to be the center of their life and devotion. 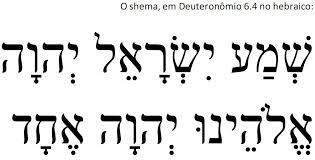 Deuteronomy 6:4 is known as ‘the Shema’, which gets its name from the first word in Hebrew of the verse. Shema means to hear or listen and these are to be the first words on their lips as the rise and when they lie down, they are to be seen and heard in their coming and in their going. They are a people constituted by these words and they are not only to say them but to talk about them to their children and their children’s children. Parents become the primary vessels by which the heartbeat of their faith is passed down. They would even wear these words as a reminder of who they were and a public statement of their devotion to the world around them. These words are to be at the heart of their identity and their life. They are not just words to be said but rather to be lived and in continually hearing these words they are recalled to their own identity. With both the Ten Commandments and ‘the Shema’ the hearing of these words is to all Israel and it is primarily the household that is responsible for passing on the faith. There will be a tension between the household and the priestly authority in times to come, within the story of Israel after the construction of the temple there will be increasing efforts to make the temple the focal point of religious authority, yet for the passing on of the faith much of that will happen in the homes. The church in America is rediscovering the reality that after a couple generations of placing the formation of faith primarily in the hands of the church that we have many who are not equipped to pass on their faith or to think about the ethical dilemmas they encounter on a day to day basis. Martin Luther understood this when he wrote the Small Catechism which equips parents to hand on the faith to their children almost 500 years ago, and perhaps the struggle is finding the balance. Families need the church or temple to call them back to their vocation of training themselves and their children but the church cannot be the only vessel of faith formation when the primary indicator of an adult’s remaining attached to their faith tradition are the conversations about their faith primarily from family members. It is also helpful to remember that, even though compared to many modern countries, the nation of Israel is fairly tiny that most people would not be able to travel to the tabernacle or the temple for more than festival type occasions and that without having access to the written texts in the home (that we take for granted) they relied on the continual hearing of these words to form their identity. I think there is a lot to learn from this type of repetition, and for example most Christians can readily pull up certain pieces of scripture that have meaning to them, the Lord’s Prayer or the 23rd Psalm for example, and these become things that can be recalled even if a person is dealing with dementia. These words can begin to form the identity of the people for as long as they are practiced and lived, yet they could be forgotten in one generation and that will happen throughout the life of the people of Israel, just as Christians will at times forget their own identity when they forget their story. 10 When the LORD your God has brought you into the land that he swore to your ancestors, to Abraham, to Isaac, and to Jacob, to give you– a land with fine, large cities that you did not build, 11 houses filled with all sorts of goods that you did not fill, hewn cisterns that you did not hew, vineyards and olive groves that you did not plant– and when you have eaten your fill, 12 take care that you do not forget the LORD, who brought you out of the land of Egypt, out of the house of slavery. 13 The LORD your God you shall fear; him you shall serve, and by his name alone you shall swear. 14 Do not follow other gods, any of the gods of the peoples who are all around you, 15 because the LORD your God, who is present with you, is a jealous God. The anger of the LORD your God would be kindled against you and he would destroy you from the face of the earth. 16 Do not put the LORD your God to the test, as you tested him at Massah. 17 You must diligently keep the commandments of the LORD your God, and his decrees, and his statutes that he has commanded you. 18 Do what is right and good in the sight of the LORD, so that it may go well with you, and so that you may go in and occupy the good land that the LORD swore to your ancestors to give you, 19 thrusting out all your enemies from before you, as the LORD has promised. The Deuteronomist is of a mixed mind about the people encountering abundance, on the one hand the abundance they are to receive when they enter the Promised Land is a sign of God’s blessing yet there is also a significant risk that in their security they will forget the LORD. There will always be the temptations to follow other gods or to live in a way that is more concerned with the individuals’ prosperity than God’s covenant of justice. They are called to be different from the peoples around them, a witness to them, and a means of blessing for the other nations. Yet it is in that difference that the people will struggle, the gods and practices of the surrounding peoples will be more concrete, these gods have images and yet the LORD is always a mystery-never contained within these images, not willing to share the LORD’s people with these other images. The gods of the surrounding nations may promise fertility or individual prosperity or a bountiful harvest, in short they promised things that were in the individual’s best interest. Martin Luther insightfully could say of sin that it is the ‘heart curved inward on itself’ and the commandments and the Shema and the unfolding of them to come are really looking towards the neighbor’s best interest. It is trying to construct a world where the community can live in justice and peace. It will always be a challenge to live into this vision when there are many competing voices encouraging the individuals and families to seek their own interest and yet it is a vision of shalom worth living into. Even with the practices outlined around the Shema there is the continual danger of a slow slide into amnesia in the generations to come. They are a people whose story emerges out of the story of God taking them out of the land of Egypt and creating them as the LORD’s own people. For their life going forward their life will be defined both by this story and by the quality of their continued relationship with their LORD. Deuteronomy will emphasize over and over the need for continued vigilance in this relationship and the blessings that will come if they keep these commandments and the curse that comes with disobedience. This entry was posted in Biblical Reflections, Deuteronomy and tagged faith, Great Commandment, Shema. Bookmark the permalink.